The U.S. economic system consists of the full range of economic entities (from sole proprietors to large corporations), organized into supply chains serving the U.S. retail consumer market. Many of these corporate entities are natural monopolies, which are regulated to protect the public interest. Federal, state and local governments grant certificates of public convenience and necessity to public utilities allowing them to invest in the required infrastructure and then operate as price-regulated monopolies. This approach avoids uneconomic duplication and use of scarce resources. In return for these exclusive franchises, regulated utility prices constrain the potential for monopoly profits and the unfair allocation of utility costs among customer classes. The U.S. system of price regulation provides cost containment points at each function of the utility service supply chain. Given a lack of coherent National Energy or Environmental Policies, it is probable that the cost containment chain has suffered breakdowns at points along the line. Originally, the U.S. regulatory system encompassed energy utilities, water utilities, transportation (particularly rail) and telecommunications providers. Congress effectively deregulated Telecommunications due to the effect of advanced technology and competition in the industry, but there are still small pockets of plain old telephone service (“POTs”) regulation throughout the U.S. Congress also reduced Transportation regulation but it still exists. Both the energy and water/wastewater industries remain as monopolies subject to regulatory cost containment points along the supply chain. Governments regulate organizations in order to protect the public interest. Unfortunately, if the regulation is not effective, it does not protect the public interest and in fact could have just the opposite result. Some regulations and regulatory agencies may be rudderless without any particular mandate or valid reason to exist. Other regulations and agencies may in fact have a legitimate regulatory mandate and reason to exist, but may have been rendered ineffective somewhere along the line. Any number of obstacles including a lack of expertise, research and analysis hampers the regulators abilities to ensure their efforts are effective. Public utilities must petition their price regulators to change their service rates and then distribute the proposed change among service rate classes such as the residential and industrial rate classes. The utilities file expert analyses to support the proposed changes, and price regulators hold formal hearings in which law firms, consumer advocates, attorney’s general and other interested parties intervene and file their own expert evidence responding to the utility’s original petition. 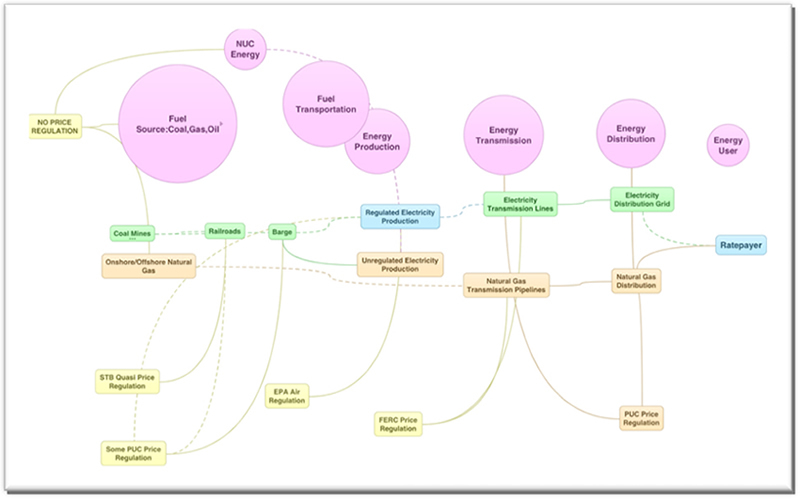 The Chart below illustrates the breadth and depth of such regulation in the energy sector of the U.S. economy.